To study the BLAST similarity search Tool. The Blast tool finds regions of local similarity between sequences. The program compares nucleotide (or) protein sequences to sequence Data base and calculates the statistical significance of matches. Blast can be used to infer functional and evolutionary relationships between sequences and also helps to identify members of gene families. It quickly searches for highly similar sequences with large queries. It quickly search for divergent sequences. It is a nucleotide-nucleotide BLAST which searches for short and nearly exact matches. It is a protein-protein BLAST which searches for exact matches. 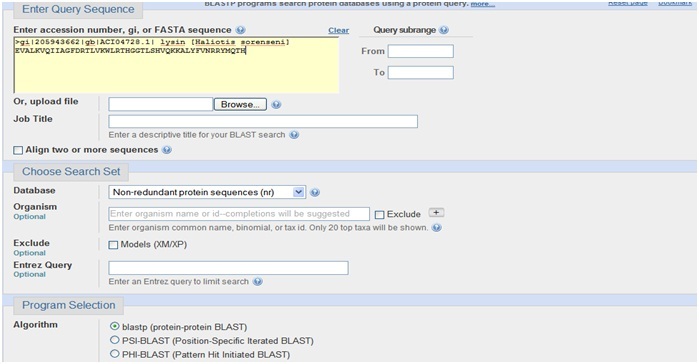 Compares protein query with translated DNA Database. 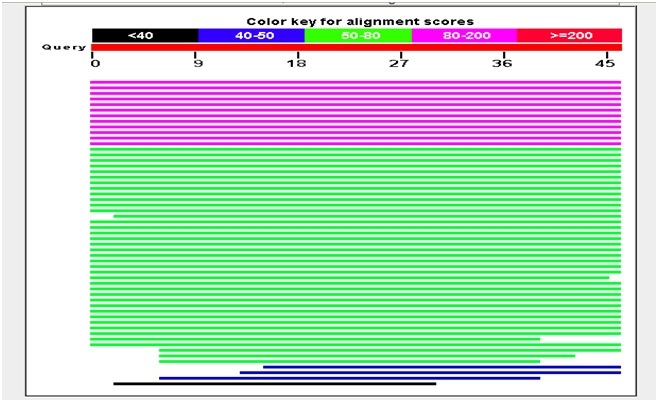 Compares translated DNA query with translated DNA database. 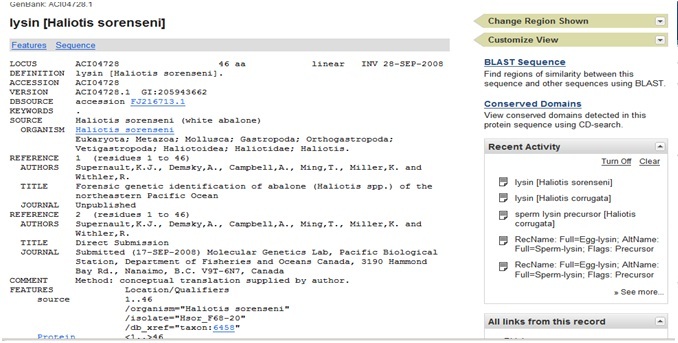 It searches for gene expression Data. It is an immunoglobin protein. The expectation value (E) is a parameter that describes the number of Hits one can expect to see just by chance. When searching a Database of a particular size. It decreases exponentially with the score (S) that is assigned to a match between two sequences essentially the e value describes the random Back ground noise that exists for matches between sequences. For example : An E value of one assigned to a hit can be interpreted as meaning that the Database of current size one might expect to see one match. With a similar sore simply by chance. This means that lower the E value (or) the closer it is to zero then it is a significant match. 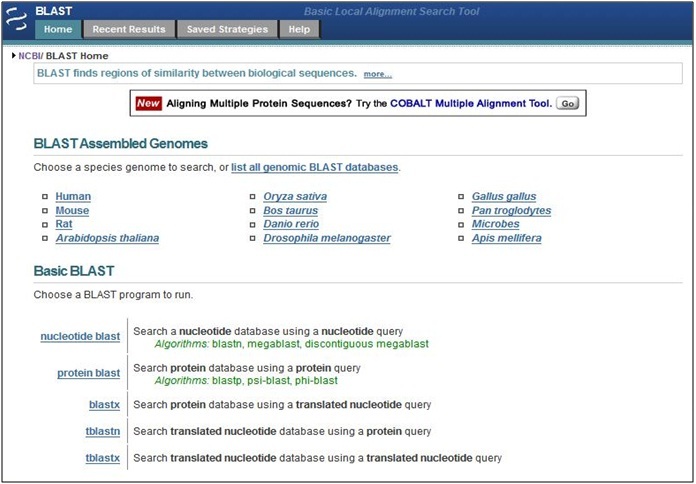 (1) Go to NCBI Homepage and click BLAST. (2) Then select the type of BLAST search you want. (3) Obtain the FASTA format of the given query. (4) After that paste your sequence in BLAST program. (5) Select the appropriate parameters (if any). (6) Click Format (or) BLAST to perform search operation. 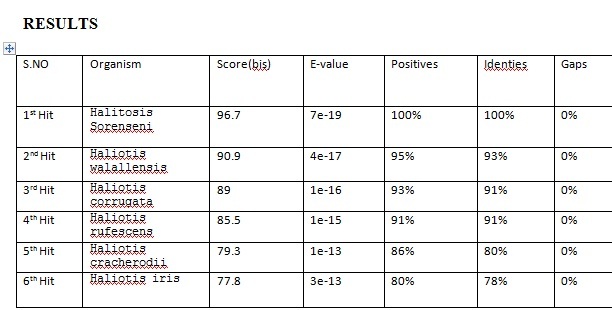 (7) You will get results displayed based on the E value and score.